One reality; and then the other reality; the latter perhaps more unusual – yet just as believable to those who experience it. Within the art world, one often speaks of Sjukdomskonst [psychiatric/outsider art], a theme that has been used in many exhibitions and on which many books have been written. In Sweden, we have Carl Hill and Ernst Josephson. 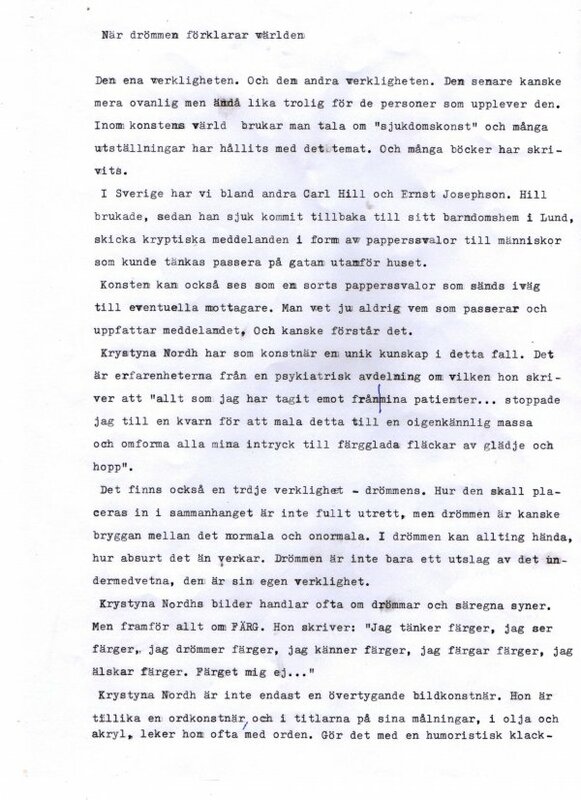 After returning to his childhood home in Lund due to illness, Hill would send cryptic messages in the form of paper planes to anyone who happened to pass by the street outside his house. Art can also be viewed as a paper plane, dispatched to its potential recipients. You never know who will pass by and who will grasp – and perhaps understand – the message. In this respect, Krystyna Nordh has a unique knowledge as an artist; this comes from her experiences of a psychiatric ward, of which she has written, “Everything I have taken from my patients… I packed into a mill to grind it down to an unrecognisable mass and reshape all my impressions into colourful flecks of happiness and hope”. There is also a third reality – that of the dream. Where it is to be placed into the context has not been fully investigated, though perhaps dreams bridge the gap between the normal and the abnormal. In dreams, anything can happen, no matter how absurd it may seem. Dreams are not simply a manifestation of the sub-conscious, they are their own reality. Krystyna Nordh’s artworks are often about dreams and strange visions. 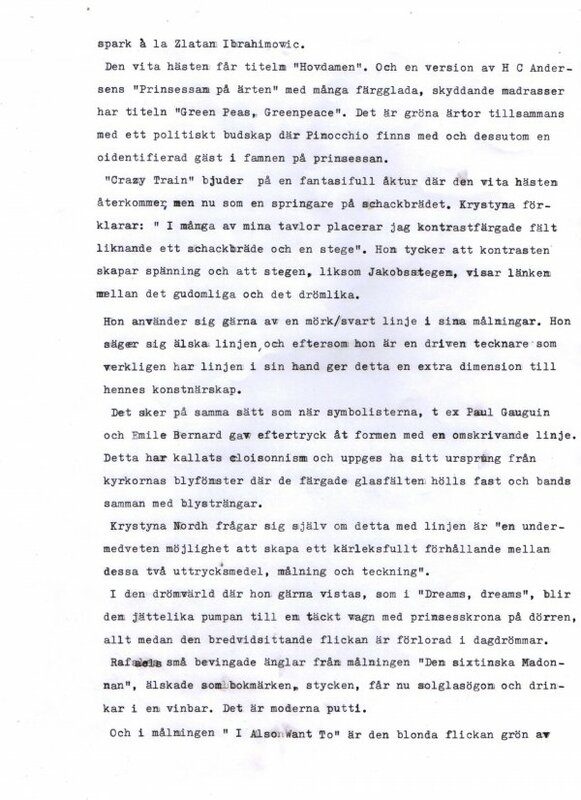 She writes, “Jag tänker färger, jag ser färger, jag drömmer färger, jag känner färger, jag färgar färger, jag älskar färger. Färget mig ej…”, meaning “I think in colours, I see colours, I dream of colours, I feel colours, I love colours.”, adding a Swedish play on “Förget mig ej” (Forget-me-not): “Färget mig ej”, “färg” being “colour”. Krystyna Nordh is not just a convincing visual artist. She is just as much a literary artist, and in the titles of her oil and acrylic paintings, she often plays with words, and does so with a light-hearted back-heel à la Zlatan Ibrahimovic. The white horse is given the title Hovdamen (with hov being the Swedish word for both hoof and court and damen meaning lady) and a version of H C Andersen’s The Princess and the Pea with many colourful mattresses, has the title Green Peas, Greenpeace. Here there are green peas, together with a political message involving Pinocchio in addition to an unidentified guest in the princess’ arms. Crazy Train offers an imaginative ride, where the white horse returns although this time as a Knight on the chess board. Krystyna explains, “In many of my paintings I place contrasting colours that are reminiscent of a chess board and ladders”. She thinks that the contrast creates tension and that the steps, just as Jacob’s Ladder, show the link between the divine and the dreamlike. She likes to make use of a dark/black line in her paintings. She claims to love the line and since she is an ambitious drawer, the line adds an extra dimension to her artistry. This echoes the works of Symbolists such as Paul Gauguin and Emil Bernard who gave emphasis to their forms with an outline. It is known as cloisonné, and is said to have its origins in the leaded windows of churches, where the colourful pieces of glass are held together and bound with lead cames. Krystyna Nordh asks herself if these lines are “a subconscious possibility to create a loving relationship between these two forms of expression, painting and drawing”. In this dream world, where she would happily stay, such as in Dreams, Dreams, the giant-like pumpkin becomes a covered carriage with a princess’ crown on the door, all this whilst the girl adjacent to the carriage is lost in a daydream. The cherubim from Raphael’s painting, Sistine Madonna cherished as bookmarks, are now given sunglasses and are drinking in a wine bar; these are the modern putti. And in the painting I also want to, the blonde girl is green with jealousy. The stairway to heaven on which a black cat sits, leads towards the moon. Yes, we all strive upwards, and Krystyna Nordh has already climbed far up the often rickety ladder of art. In her painting Cayenne Pepper, the colours and other embellishments are given a delightfully fiery taste. It truly burns, and here she shows a sensitivity to colour that can help her to climb even further up the nevertheless wonderful Jacob’s Ladder of art. 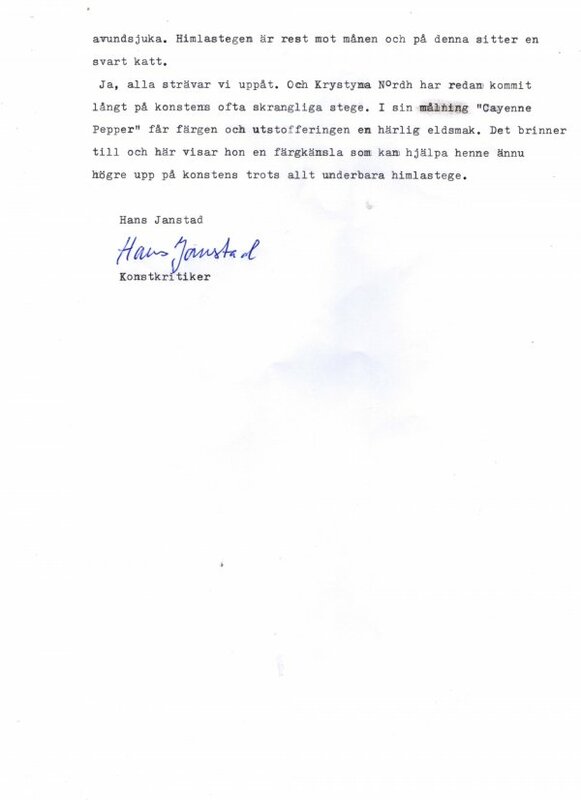 Konstkritik av Hans Janstad, del 1 -3.